Qi is my neighborhood (home and work) standby for better-than-you’d-think Thai. It’s usually crispy pork and basil and a beef tendon if it’s dinner or duck salad if it’s lunchtime. 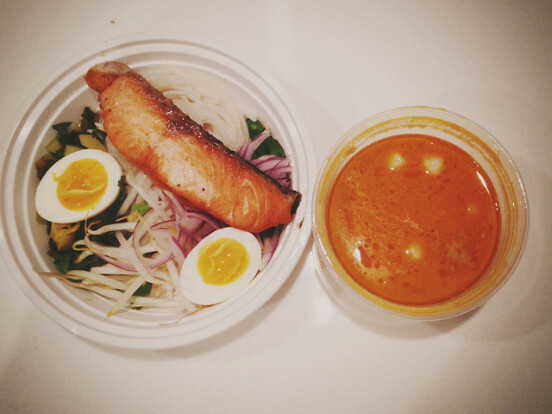 Maybe what they say about travel is true and now my horizons have been broadened because I broke out of my routine and ordered something listed as salmon wild ginger curry with kanom jiin noodle a.k.a. 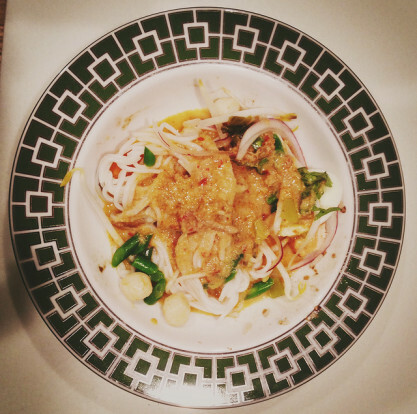 Brooklynized khao soi (it’s not served at the Times Square branch). And it was good. The lip-tingling coconut milk broth, seven on a scale of one-to-ten, with fish balls resembling mini bocconcini comes separate from the base components–musty strips of krachai, sour, slightly sweet cabbage, bean sprouts, chopped green beans, sliced red onions, thick round rice noodles–to reduce transitory sog. I couldn’t say whether the kanom jiin (more commonly spelled jeen) were fermented over a period of days as tradition dictates. I do know that the egg yolks remained impressively wobbly while the salmon skin had lost most of its crunchiness, as would be expected as side effect of delivery. The main thing that was off was the proportion of liquid to stuff (the primary photo is half of what came in the plastic containers). It got a little soupier after a stir, though. That’s the Brooklyn Flickr filter, by the way (I’m two-timing Instagram). Could you tell? What neighborhood in Brooklyn do you think that is? ← Hot For 2014: Bread Bowls?